Being renters, we find it hard to get creative with decor. We don't want to punch too many holes in the wall or spend a lot of time or money on temporary items. Recently, TWSF has decided to get crafty with small food related DIY projects that are inexpensive and transportable. We'll be documenting these projects, and filing them under "Leftovers." 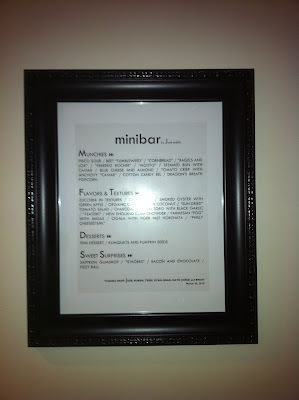 At the end of my 24th birthday dinner at minibar last year, the wait staff presented all diners with a keepsake menu. We thought this was awesome, and decided it was pretty enough to display at home. I bought a cheap frame (under $10) at Target and used a piece of computer paper to back the clear menu. It is the perfect decoration for any kitchen, and requires little effort. So next time you have that unforgettable dinner, ask for a copy of the menu and hang it in the kitchen as inspiration.